Cities Connection Project | LES COMMUNAILLES. ONEX. 96 apartments for inter-generational interaction, in arcades and on the upper floors. A stairwell for six flats, each structured around a kitchen and bathroom core for better mobility. A balcony for privacy. On the landing, multi-purpose spaces, laundry or play areas, promoting contacts and sociability. A social and architectural interlocking that is reflected right up to the facade, in the fashion of a mineral Tetris. The project is representative both in its typological variety and in its architecture. Despite the sheer scale of the project, the richness of the distribution spaces allows to favour the conviviality. 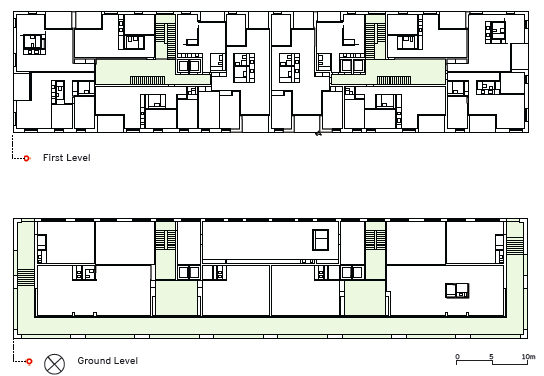 These distribution spaces include dilatation spaces, appropriate to game and to encountering. These spaces as well as the laundries are located in facade, distributed randomly in the building. They allow differentiated sights according to floors and become real indoor streets linking the communal spaces with the arcades, the common areas, the bicycle room, the parking, the basement and the park. The social and architectural interweaving reflects itself into the façade, in a rigorous system with complex appearance. The complexity breaks the monotony of the collective housing that characterise the suburb, so as to offer a different way to cohabit.